Chancellor, Vice-Chancellor, honoured guests and graduands, it gives me great pleasure to be presenting today, Susan Diana James (former Chief Executive of Derby Teaching Hospitals) for the award of Honorary Doctor of the University. Sue is a highly experienced NHS leader who worked as a chief executive for almost 20 years before retiring from Derby Teaching Hospitals. In a career that spanned over 40 years, Sue has undertaken a variety of general management posts within the acute sector of the health service. Her first role was as hospital administrator at The Middlesex Hospital in London, which she joined as the ‘winter of discontent’ began in 1978. In that role Sue got a wonderful all round experience of hospital management, project managing the very first computerised patient master index in the NHS, and being involved in all aspects of ward and department management. She even acted as a catering porter during a period of industrial action! Over the next five years Sue gained her diploma in Health Services Management. She spent time in academia, teaching Health Services Management at the Polytechnic of the South Bank in London where she became Course Director of the professional diploma course that she had attended as a student only a few years earlier. In 1985 Sue, her husband Peter and young family chose to move out of London to further Peter’s career in the railways when he secured a post in York. After the birth of her second child, Sue returned to hospital management in a planning role at St James's Hospital in Leeds. After years of working in London, Sue was astonished to see how differently women were regarded 'up north'. She observed that they were rarely in positions of power or influence, and became determined to demonstrate to herself and others that this situation was changing. She therefore applied for one of the new breed of general management posts, and to her astonishment was successful, and became the Unit General Manager for the Surgical Unit of Leeds General Infirmary in 1989 when she was just 33. Sue was the only woman in a managerial role outside of nursing in that hospital. This was a pivotal point in Sue's career. During her time as a Unit General Manager, she learnt how to work with doctors and how to lead teams: two skills that were the bedrock on which her future career was based. They were tough years too: Sue describes the experience as 'the furnace that forged my managerial resilience'. One of her tasks during that time was to reduce waiting lists - which were running at over four years in some specialties. Sue was appointed to her first Chief Executive role at Barnsley District General Hospital, shortly before turning 40. She recalls feeling a frisson of excitement and terror when she realised that she had achieved her ambition, but of course getting the job was only the beginning: Sue then had to prove herself as a hospital leader. That role, and the three Chief Executive positions that followed, saw Sue deliver a range of ground breaking new initiatives including new partnership arrangements with other hospitals, one of the first hospital quality strategies, and the procurement and commissioning of a new Privately Financed hospital. She developed a keen interest in leadership, and became an active mentor, supporting many other young managers, at the start of their careers. In 2006 Sue was appointed to the National Leadership Council and Chaired the National General Management Training Scheme. She also spent time every month working on the front line, as a health care assistant, porter or cleaner which enabled her to gain a better understanding of the pressures front line staff experience, and to appreciate how remote the boardroom can seem to most staff. During her time as Chief Executive of Derby Teaching Hospitals she strengthened the role of clinicians in the management of hospital services, and led the development of a values-based culture which saw the Trust win the first ever national award for compassionate care. Sue has been a tireless advocate of partnership working between health and social care organisations across Derbyshire, and has worked closely with the University to create education programmes to develop the new professional roles needed in tomorrow's health service. Sue also supported the education of health professionals in her role as Chair of the Local Education and Training Council which brought together employers and educational institutions. For her outstanding contribution to NHS Leadership Sue was presented with a Lifetime Achievement award in 2015. 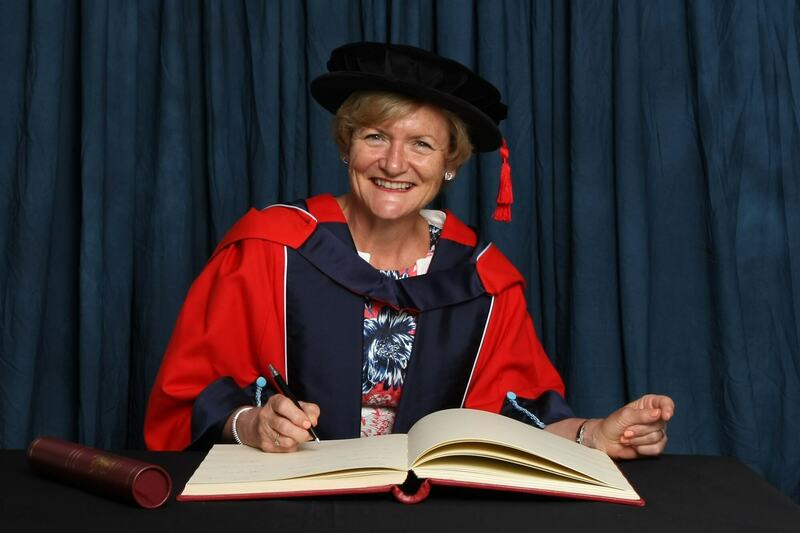 Chancellor, in recognition of services to health and social care through her outstanding leadership, we are delighted to award Sue James the honorary degree of Doctor of the University.